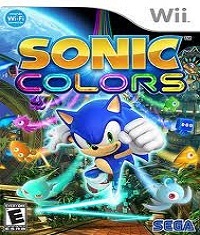 This is what frustrates me most about Sonic Colors for the Wii. This game comes SO close to getting it right, that every time it doesn’t I just want to let out a prequel Darth Vader level, “NOOOOOOOOOOOOOOOOOOOOOOOOO!!! !” loud enough to make my neighbors question my mental faculties. It comes so close to reaching its goal that even though it’s just a mostly inanimate, emotionless piece of plastic designed to provide me with a few scant hours of entertainment (there’s a naughty joke buried in there somewhere, but this is a kid’s game so keep your minds G-rated, people) that I almost find myself feeling, well… a little sorry for it. Regardless, this is as close to getting it right as Sonic has ever done in a 3D game, and Sonic team/Dimps has accomplished that by going back to basics, borrowing some well proven concepts, and making half the game 2.5D. Read on. I’m sure you won’t be surprised to discover that the story to Sonic Colors is not a Greek epic. Robotnik has enslaved these little glowing critters call Wisps and is using them to power his new intergalactic theme park, which is actually a cover for a new mind control weapon, and Sonic rushes to free them from their slavery by enslaving them to give him new super powers, but let’s not get into the moral implications of Wisp rights, shall we? The point I’m trying to make is that, much like every Sonic before it, or many similar platformers that we’ve been enjoying for over twenty years now, Sonic Colors is by design light on story, but heavy on character, and gameplay. But I will say this – the story this game tells is far better than any Sonic game over the past two generations hands down, in no small part due to the humor and the surprisingly high quality of the voice acting, so overall I’m giving the story a thumbs up. It’s games like this that really make me wish the Wii could do at least 720p, because my God, this is a gorgeous game. I know this year has seen the release of Donkey Kong Country Returns, Metroid: Other M and Super Mario Galaxy 2, but let me tell you, this is probably the overall best looking Wii game I’ve ever seen. 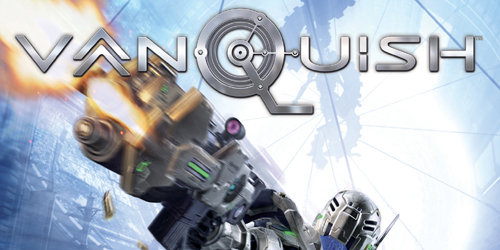 If not for its resolution, it would almost be close to the quality of Ratchet and Clank: A Crack In Time. That’s how vibrant and rich this game looks. It’s the sharpest looking non-HD game I’ve seen in some time. 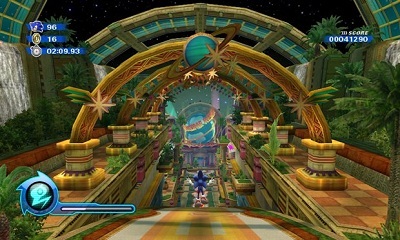 There’s minimal aliasing (for a Wii game anyway), the colors just explode off the screen everywhere you look, the animation is fast and fluid, there’s no screen tearing that I could see, no real slowdown on display, the character designs look great, and the levels are just pure eye candy, from the traditional Sonic forest type level to vast, sun drenched vistas with skyscrapers made of cheese burgers. Yes, it’s utterly ridiculous, but so is a blue talking hedgehog who can run at sub-light speed. I can’t stress this enough. This is one of the best looking games of this year, arguably across all three consoles. The game’s sound offerings are a welcome mixture of, “If it ain’t broke, don’t fix it.” and. “Oh thank God, they finally got it right!” The music is memorable, and it just feels like a Sonic game (moreso than the forgettable music from Sonic 4). The horrible jazzy garbage from Sonic Unleashed has been flushed to the sewer depths where it belongs. There’s still a couple of rock songs, but neither have that horrid, “We’re trapped in the 80s.” vibe we’ve all come to despise. One even has a sort of pop-punk sound, which I think suits Sonic to a tee. The in-game tracks emphasize speed and fun, which is as it should be, and I’ll probably find myself whistling a few of them ten years from now, so I’m very pleased with the results. The is the closest Sonic has sounded to Sonic musicwise in a long time, a return to form. Ever since Sonic started talking in Sonic Adventure, it’s left a sour taste in my mouth. For the past ten+ years, Sonic has sounded and acted like the “trying to sound dangerous and edgy” best friend of the star in a teen-oriented American sitcom. It’s always felt out of place and fake, like a European’s idea of what an American teenager sounds like. This is no longer the case. The dialog is much more natural and has a smoother, less scripted feel. And its funny to boot. There are several self-deprecating lines in the script where the developers flat out make fun of their own previous games in the series, which if nothing else, shows they’ve at least been listening to the complaints of fans over the past decade, if not actually doing anything about it until now. This time around, Sonic is being voiced by Roger Craig Smith, who is a bit of a known name in the video game voiceover field, having done the voice of Ezio in Assassin’s Creed 2, and Chris Redfield in Resident Evil 5. I know it doesn’t sound like a good fit, but he’s probably the best Sonic Sega’s ever had. He does try to keep his tone in line with the previous actor Jason Griffith, but his dialog is much less stilted and is more “sarcastic smart mouth” and less “fake edgy” in style. Think of a slightly lower key Spider-Man or a slightly meaner Ratchet and you’ll get the idea. There’s even a moment or two where Sonic breaks the 4th wall and talks directly to the player. It’s just a totally different feel from the cheesiness of the previous scripts and actors, and the results are a very welcome change. 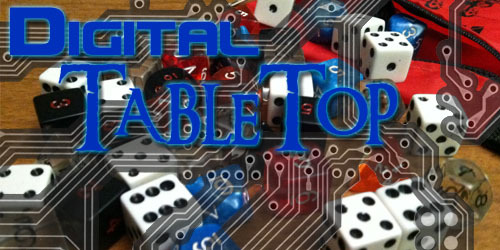 Playing two player co-op, however, is not as successful because of the speed element. If you’re player one, and you hit a burst of speed that shoots you across the screen and your cohort isn’t keeping up, he’ll enjoy the wonders of an instant kill. This ups the difficulty in the co-op, making it a bit more frustrating than it needed to be. Much like with Contra, each player needs to stay cognizant of where the other player is at to avoid causing an off-screen insta-kill. The levels are very well designed, up until a few choice sections of the last few zones, then you start running into a few cheap deaths caused from instant death falls and a sudden lack of checkpoints, causing you to have to replay several minutes of a level, only to get your timing wrong and again fall to your death. 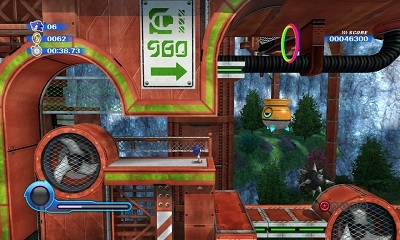 For a game that was initially touted by its director as being designed for “players between the ages of six and twelve,” there are a handful of high difficulty platforming areas towards the end of the game, so much so that I wonder if maybe the difficulty was ramped up after the backlashed those comments caused. Now, about the controls. First off, if you have a Classic controller, use it. It’s a lot more accurate than trying to play with the motion controller and nunchuck (though there’s nothing broken about playing with the traditional Wii controls at all. The Classic controller just feels better and it’s bit more intuitive.) Even so, there are a couple of issues here. The controls are really tight and responsive for the most part, except for one or two minor problems. First of all the physics seem a just a wee bit off in the jumping department. Sonic feels like he has a little less weight than he used to, giving him a slightly bouncy feel. 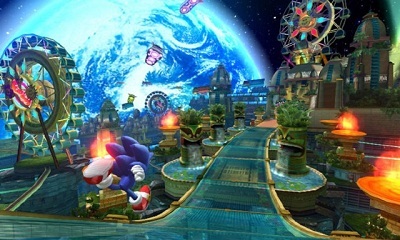 (this might be due to him playing through an amusement park in space, but the game never says as much.) Added to this is a new double jump mechanic that’s great in concept, and it works fantastically 99% of the time, but try to pull it off too close to a lockable object and you’ll end up doing a homing attack to an area of the screen you weren’t trying to get to, which can cause some unintentional deaths. This can pose a problem in the aforementioned later levels. Regardless, these few minor control issues are not game breaking by any means at all, and are in fact phenomenal in all other respects, but longtime Sonic players may have an adjustment period to slog through before they get the hang of things. Now, here’s the best part. You will never have to play with Tails. You will never have to play with Shadow. Or Silver. or Big. Or Sophie. Or Metal Sonic. Tails is the only side character this time around, and he’s only in the cut scenes. Finally, Sonic Team has figured out that more doesn’t always equate to better. Yes, the co-op isn’t exactly meeting its true potential, but still, there’s a lot of game to enjoy here. 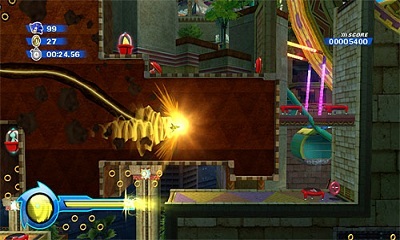 Several of the levels have multiple pathways, some of which can only be used after having earned the required Wisps from later levels. There’s a “Sonic Simulator” game that can be played solo, or in competitive/cooperative co-op in what equates to this game’s “challenge missions.” You can play these levels as a “Sonic Bot” or as a Mii. These levels are unlocked by finding special hidden rings in each level of the main game, and are simple but fun. There’s also a separate challenge mode where players can play through the game levels indefinitely until they run out of lives, their times and scores appearing on a world leaderboard. In short, there’s a lot of game here for your fifty bucks. As stated, this game is a joy, and perfectly balanced, right up until you get to around act 7 or so. Then the difficulty in the 2.5D platforming areas jumps up a notch or two with little warning. None of it is by any means insurmountable, but this isn’t Sonic’s Epic Yarn either like many feared it would be. After the first six levels you may find yourself falling to your death a bit more often, maybe even enough to frustrate you, depending on your skill level. It’s definitely a Sonic game, and it’s a Sonic game that succeeds (mostly) by borrowing mechanics from other modern platformers. 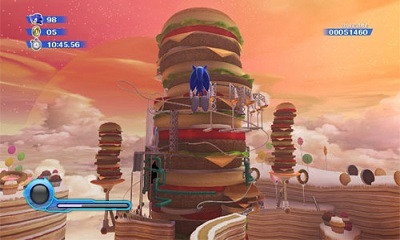 So while it’s not really original in and of itself, Sonic Team has at least learned that you don’t have to break the mold to stand out, that its okay to incorporate aspects from other titles so long as they work within the framework of Sonic’s world, and that concept is a very original aspect in the history of this series. So the originality isn’t the greatest, but by borrowing from other successful franchises, and delivering voice actors that work with a script that’s actually funny instead of groan-enducing, the overall effect is almost like playing the first Sonic game for the first time all over again. None of it is fantastically groundbreaking, but dang if it all doesn’t feel new again. For the second time in just a matter of months, I can say that a Sonic game has me hooked. This is the most time I’ve spent on a Wii game consecutively in a long time. the multiple play modes alone will keep you coming back, but the leaderboard will keep you reaching for that better grade, that higher score, that new path you can finally get to, and the possibility of speed runs the likes of which Mario fanatics can only dream of. True, there are times where you’ll want to rip the game out of your Wii and chuck it against the wall. But like a scorned ex, you’ll come crawling back to it, having convinced yourself that everything else that’s so right is worth putting up with the few things that are so wrong, regardless of how frustrating they can be. This game has legs, and claws, and it will keep you hooked for a good while after that last finish line is crossed. There will unavoidably be Sonic purists who tear into this game because it’s not Sonic Two, just like they have every game since, well, Sonic Two. Hey, it’s their loss. Short of the above mentioned issues that keep this game just inches from greatness (and nail-bitingly so at that) this is a title that will put smiles on the faces of gamers of all ages and skill levels, and actually has cut scenes that don’t make you want to eat your own face off with a wooden spoon. It’s hands down one of the best Wii games released this year, and certainly one of the best platformers released on any console this year. And yes, I actually had more fun with this than Super Mario Galaxy 2, mainly because it never feels like a bulked up expansion pack to the previous installment. If you’re into platformers and fast, frenetic gameplay, this is your game. The only question really is if this will be enough to erase a decade of bad game karma. Thanks to Sonic Team’s repeated floundering, the Sonic name is not what it once was. There are many I talk to on a regular basis who haven’t even considered RENTING this game because they assume anything with the word Sonic in the title is an instant entry for the Ultimate Fail list. While I think on its own merits it can appeal to a wide audience (and an even wider one if Sega, as rumored, decides to port it to the other consoles) I just hope people give it a chance so the dark looming shadow of the franchise’s numerous screw ups doesn’t keep it from reaching the audience it deserves. And it deserves a large one. Regardless of a few tweaks it could have benefited from, this game should be a big hit, and is so very shy of being an instant classic. Sonic Colors is not quite all that it could have been (and maddeningly so), but it’s so much more than what we’ve come to expect. It’s a sign that Sonic Team is finally starting to understand their franchise and what makes it work again, and while there are a few rough edges that keep this game from being the instant classic Sonic fans wanted it to be, it comes closer to that goal than any other 3D game in the franchise ever has. It makes me hopeful for the future of the franchise, and that Sonic Team will learn from the mistakes made here and keep refining it until Sonic justifiably reclaims his former iconic status.